The Milfanito are beings created long ago by the Great Dead One. They have little concept of self and live only to sing. The Great Dead One taught them song, and that their singing grants comfort to those who are cursed with the Darksign (“bear death and Dark within themselves”). They have sung ever since they were taught and will sing eternally for those afflicted. When they sing the little brightbugs found in the marshlands leading to the Undead Crypt ‘dance’ or flutter about and this pacifies the Undead Lizard Men in the area. These undead have spent so long in the water that they have adapted into lizard like creatures, indicating the brightbugs can keep them entranced endlessly. These brightbugs were born from (ie. created by) the Great Dead One. The Milfanito live only to sing, and will continue singing until they can do so no longer. Because the Milfanito and Fenito were both created with express purposes to comfort the Undead, and because their names end with ‘nito’ it is often presumed that the “Great Dead One” and the One who gave us the first death are references to Gravelord Nito from Dark Souls 1, or what is most probably (because we do not encounter Milfanito or Fenito in Dark Souls 1 and we know that during these events Nito dies for good) an incarnation of his soul, prior to the Rotten. Perhaps this incarnation was the eponymous “Amana”? We know that the Rotten embraces all in his sanctuary for all things unwanted or tossed away and that Gravelord Nito expended much of the energy of his Lord Soul on death, bringing eternal rest to the undying. This would seem to indicate a benevolence towards the Undead, who are creatures both unwanted and undying. The creation of beings whose sole purpose is to bring comfort to the Undead therefore seems to align with that benevolence. “Gravelord Nito, First of the Dead” – Lord Soul description – First of the dead may imply he was ranked first or the first to die. Because of the Old Dead One Soul it seems to confirm that he was the first to ‘die’. “Great Dead One” – Milfanito description – swaps out Great or Old, both true descriptors of Nito. “The One who gave us the first death” – Fenito and Darkdrift description - First of the Dead and the one who gave us the first death could mean the same thing, if the First of the Dead means that they were the first to die then this would again reference Nito. The Milfanito live in the Shrine of Amana (the marshlands leading to the Undead Crypt) and “will never leave”. Of the 4 Milfanito in game, we encounter 3 at the Shrine. The final Milfanito in the Drangleic Castle tower is clearly being held against her will. The true nature of the Milfanito is mysterious. They appear to be humans, and there are clear indications that they are undead or at least eternal. It seems possible if not probable that their life force is tied to the Rise of the Dead and perhaps this is why they cannot leave the area. The Rise of the Dead is a shrine that restores the humanity of those without any. The Milfanito are constantly human in appearance, yet hold no effigies. There is a Milfanito singing at the shrine and the entrance can only be used by one who is Undead, implying that she must have been Undead to gain access. It may be that the ‘hollowed’ looking Milfanito we encounter prior to the Demon of Song boss fight is the same Milfanito we encounter next to the Rise of the Dead shrine, after being restored to her human form. Milfanito appear to go hollow if they cannot sing. The same fate befalls both the Milfanito beside the Demon of Song whose song may have been ‘stolen’ by the Demon of Song and the Milfanito trapped in the tower who can only sing once she is freed. 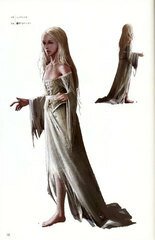 Her appearance is regular, but this can be explained by the Ring of the Dead which she drops, a ring that gives human appearance even when hollow. The Milfanito’s purpose to sing, is as we are told, a way to comfort the Undead, but there may also be another aspect to it. The Milfanito’s position on the way to the Undead Crypt allows them to pacify the Undead and in a sense enchant them. We know that the Undead are drawn to the song of the Milfanito, because if they weren’t the Demon of Song would not have learned to sing to lure travellers in. Therefore, the Shrine of Amana may in fact be a place of preparation for the Undead Crypt. Those who enter it are pacified, and if judged worthy in their reverence, will be buried alongside those who have come before by the Fenito. The Embedded is a clergy man or high ranking member of Drangleic overseeing the Shrine of Amana. The Milfanito have ‘always’ been there. The Embedded begins to develop a strange fascination with these women, and carries out an internal struggle to resist ‘the temptation of the flesh’. The Embedded realises he will not be able to overcome this desire. He begins to transform into a demon, but like the 2 sides of him that struggle against each other, he takes the form of 2 separate beings. He establishes an order of maidens to contain the beast then seeks a way to end the life of the Demon of Song, but is not strong enough himself to do it. He eventually concludes that the only way to resolve things is for both he, The Embedded to be killed and the Demon of Song as well, finally putting an end to the whole matter. 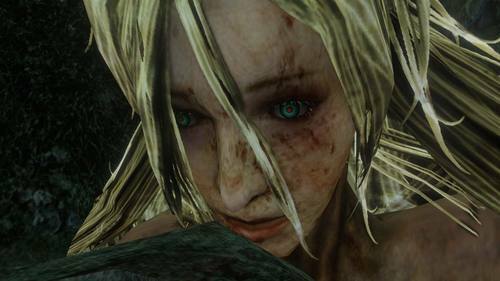 To bring about this situation he kidnaps a Milfanito and locks it within a cage in the highest tower of Drangleic Castle (echoing the ancient stories of maidens trapped in towers throughout human history). These maidens are always saved by a brave warrior. The Embedded gives the key to the maiden’s cage to the Demon of Song while it is contained (possibly sleeping) by the shrine maidens and then chains himself inescapably to the cage. By doing this he forces this brave warrior to kill the Demon of Song and himself, while also freeing the Milfanito and in some way making penance for taking her in the first place. We are here to sing to those bound by death and Dark. We will sing here, forever, as we always have, from long, long ago. We know nothing of the world outside. And why should we? For we will never leave. Do you seek King Vendrick? But what is a king, after all? For we will never leave here. When we sing, the little ones dance. The little ones grant comfort to those who bear death and Dark. This is what we were taught. This is all that we can do. You quelled that cursed singing. They may be of no use outside, but please take these. We hear a song in the distance. You rescued a Milfanito who was taken from us. Take this… We Milfanito thank you. Milfanito, that is what we are called. Do you mean our name? We sing eternally for those who bear death and Dark within themselves. We know nothing of the outside world, and we do not need to. The little ones were born from the Great Dead One. And the Great Dead One taught us song. We have sung ever since. To comfort those bound by death and Dark. Do you seek comfort, too? Take this, at the very least. You silenced that cursed singing. Please accept these as a thank-you. A songstress given eternal life by the great dead one. The Milfanito, an immortal race who sing to comfort those bound by death and ark, resign in the Shrine of Amana and have never seen the outside world. They are particularly linked to one another through a hive mind and posses only rudimentary awareness of their individual selves; this trait combined with their purity, innocence, and general naivete has resulted in several of their number either wandering into the territory of the Demon of Song or being kidnapped and carried off by outsiders with ill intentions. A member of the Milfanito race, immortal maidens given life by the Great Dead One. She spends her days at the Altar of the Living, praying for those bound by death and dark. A Milfanito kidnapped and imprisoned by the one known as the embedded. Unable to fulfill her duty in calming the dead, she now spends her days in tears and sorrow. A scattered and wounded Milfanito found cowering outside the boss room in the Shrine of Amana, apparently attacked by the Demon of Song. How she survived the encounter is uncertain, she might actually be a ghost. Dress worn by a far-gone muse. Offers almost no physical defense, but is blessed with high resistance to magic. These enchanting singers were given song by the Great Dead One, and have little concept of self. They live only to sing, and will continue singing until they can do so no longer.